A raw turkey pet food brand is being recalled after testing revealed Salmonella contamination and 1 person became sick after handling the product. 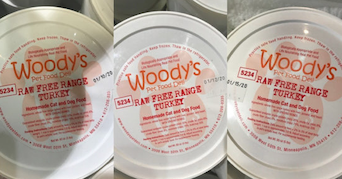 Minnesota-based Woody’s Pet Food Deli has voluntarily recalled 6 batches of its raw turkey pet food for dogs and cats due to concerns about the possible presence of Salmonella. Product testing was initiated by the Minnesota Department of Agriculture after the state’s health department identified a case of Salmonella serotype Reading infection in a person who regularly fed this food to a household pet. The pet tested positive for a different strain of Salmonella. Anyone with the product should stop feeding it to their pets, discard it in a secure container, and thoroughly clean and disinfect refrigerators/freezers where the product was stored as well as bowls, utensils, food prep surfaces, pet bedding, toys, floors, and any other surfaces with which the food or pet may have had contact. Customers may return the product to any Woody’s store for a full refund. According to the Centers for Disease Control and Prevention, 216 cases of Salmonella Reading infection have been linked to raw turkey products intended for both people and pets since December 2018 across 38 states. One person has died and 84 have been hospitalized. Affected individuals have reported eating different types and brands of raw turkey products purchased from many different locations; 3 people lived in households where raw turkey pet food was fed to pets. A common supplier of raw turkey products or live turkeys that could account for the outbreak has not been identified. Salmonella can affect animals and people. Pets can become carriers for the disease and infect other animals or humans. Human infection is manifested by nausea, vomiting, diarrhea or bloody diarrhea, abdominal pain, and fever. Infected pets may show no signs or may experience diarrhea, fever, and vomiting. Those who think their pets have become ill after consuming contaminated pet food should first contact their veterinarian. Veterinarians who wish to have pets tested for Salmonella may do so through the Veterinary Laboratory Investigation and Response Network if the pet is from a household with a person infected with Salmonella.